Renal impairment is a common complication of multiple myeloma occuring in up to 50% of patients at some stage in their disease. Due to occurrence of cast nephropathies we hypothesized circulatory dysregulation (vasoconstriction) in the kidneys with measurable elevation of the resistance index among these patients which would have a diagnostic impact. 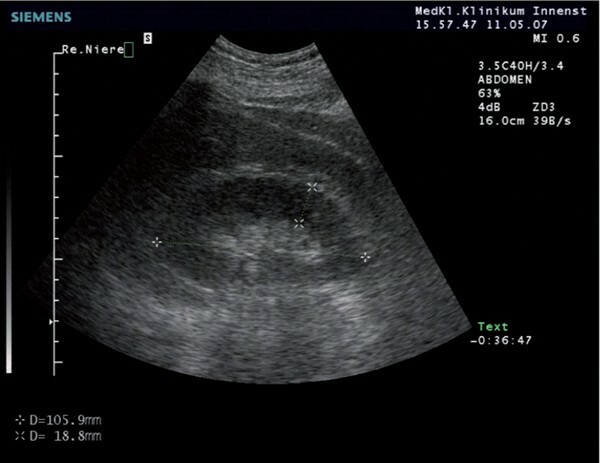 36 patients with treated multiple myeloma (21 females, 15 males, mean age 61.6 ± 8.5 years) were prospectively examined by conventional abdominal ultrasound with focussed investigation of the kidneys. First, length of the organs, parenchymal width and characterization of parenchymal echogenicity were determined. Then, intrarenal RI values were measured in segmental and arcuate arteries, respectively, in both kidneys. Additionally, serum creatinine, BUN and GFR of each patient were evaluated. RI values were compared to values of 78 healthy control subjects. Mean renal RI was 0.68 ± 0.07 which was slightly higher than in controls with 0.62 ± 0.05, but without statistical significance. Due to the laboratory analyses patients were subdivided in those with normal (group 1, n = 21) and those with impaired (group 2, n = 15) renal function. In both groups kidney size and parenchymal width were normal. Significant more group 2 patients (60%) revealed hyperechogenic par enchyma than group 1 patients (24%) (p < 0.01). Mean renal RI indices were 0.67 ± 0.06 (right) and 0.69 ± 0.06 (left) in group 1 patients and 0.71 ± 0.08 (right) and 0.71 ± 0.07 (left) in group 2 patients and showed no significant difference (p = 0.06 and 0.15). Renal RI values are not significantly elevated in patients with multiple myeloma even in those with renal impairment so that no hints to a relevant vasoconstriction could be evaluated. RI seems not to be a relevant parameter for the diagnosis of cast nephro pathy of multiple myeloma patients. Routinely performed ultrasound examination should be more focussed on the qualification of parenchymal echogenicity. Renal impairment is a common complication of multiple myeloma occuring in up to 50% of patients at some stage in their disease [1, 2]. Exceeded production of monoclonal light chains by multiple myeloma cells and their excretion in the urine as proteinuria (Bence Jones proteins) is the main pathogenetic factor. Later on, tubular atrophy and interstitial fibrosis develops with unfavourable prognosis and requirement of dialysis in 2-3% of the patients [3–8]. The precipitation of light chains, which form casts in the distal tubules, results in renal obstruction  and is the most common cause of renal impairment in multiple myeloma. Due to these parenchymal changes we hypothesized circulatory dysregulation in the kidneys with potential elevation of the resistance index (RI) among multiple myeloma patients. Rivolta and coworkers showed that renal RI correlates with the glomerular filtration rate of the kidneys in patients with liver cirrhosis . Measurement of the intrarenal resistance index has been widely established in the evaluation of renovascular changes. The dopplersonographic RI measurement is a wide-spread method to get indirect information about the vessel resistance and the perfusion distal of the measuring point. The aim of our study was to perform renal RI measurements in patients with multiple myeloma and to evaluate if these values show a correlation to renal function. Elevated renal RI values as hint to vasoconstrictive effects in the kidneys of these patients would have a diagnostic impact. We prospectively examined 36 patients (21 females, 15 males, mean age 61.6 ± 8.5 years) of our hematological department with multiple myeloma who were sent to our gastroenterological department for a routine abdominal ultrasound investigation. 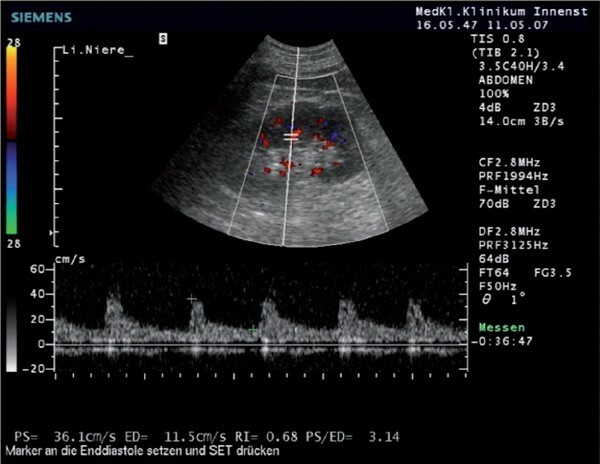 After fasting for at least four hours, all subjects were examined by B-mode ultrasound and colour-Doppler ultrasound with a 3.5 MHz broadband convex scanner (Siemens SONOLINE Elegra, Erlangen, Germany). Renal length and parenchymal width were determined for both sides (Figure 1). Sonographical measurement of the length (10.6 cm) and the parenchymal width (1.9 cm) of the right kidney in a patient with multiple myeloma. Colour-flow-doppler signals were taken from segmental arteries near hilum (seg) and arcuate arteries of the cortex (arc) in the right and left kidney, respectively. The examination was done from experienced investigators (US, HK, MG). Intrarenal RI was determined from analysis of the spectral waveform as follows: the peak systolic velocity minus the lowest diastolic velocity divided by the peak systolic velocity (RI = [VmaxSystole-VminDiastole]/VmaxSystole). The height of the pulsed Doppler waveform was maximized to facilitate measurement. The mean RI was calculated as an average of three measurements. Each measurement was done on condition that at least three waveforms followed each other (Figure 2). Measurement of intrarenal resistance index (RI) on a segmental arteria. At least three waveforms following each other were documented. RI is determined with a value of 0.68. Additionally, serum creatinine, blood urea nitrogen (BUN) and GFR of each patient were determined. Glomerular filtration rate (GFR) was estimated by calculated creatinine clearance. Informed consent of the patients was given, respectively. RI values were compared with values of 78 healthy control subjects. Statistical evaluation was performed by student's t-test. P-values < 0.05 were considered as statistical significant. Mean renal RI was 0.68 ± 0.07 which was somewhat higher than in controls with 0.62 ± 0.05, but without statistical significance. Due to the laboratory analyses we subdivided the patients in those with normal serum creatinine, BUN and GFR (n = 21, group 1) and those with elevated serum creatinine/BUN and decreased GFR (n = 15, group 2). Mean age of both groups was similar without significant difference (group 1: 60.2 ± 9.6 years, group 2:63.4 ± 6.1. years). All relevant clinical and laboratory data are given in Table 1. In both groups similar values were measured for kidney length (group 1: right 10.3/left 10.9 cm; group 2: right 10.1/left 10.5 cm) and parenchyma width (group 1: right 1.7/left 1.6 cm; group 2: right 1.5/left 1.6 cm) (Table 2). Only four group 1 patients (24%), but nine of group 2 patients (60%) revealed hyperechogenicity of renal parenchyma as hint to an interstitial nephropathy. This difference was statistical significant (p < 0.01). Mean renal RI indices were 0.67 ± 0.06 (right) and 0.69 ± 0.06 (left) in group 1 patients and 0.71 ± 0.08 (right) and 0.71 ± 0.07 (left) in group 2 patients. The slight differences were without statistical difference (right p = 0.06, left p = 0.15) (Table 2). Measurement of the intrarenal resistance index (RI) has been widely applied in the evaluation of renovascular changes. It is a suitable method for the determination of vasoconstrictive effects in the kidney. Most investigators define a value lower than 0.7 as normal in the adult population. Important to know that the height of RI depends on interobserver-variabilities and the age of the patients [11–13]. In a own prospective study we determined values in a range between 0.59 - 0.63 upon 78 healthy subjects and revealed that RI increases with age, about 0.001 per year , which is in accordance to others . Renal vasoconstriction occurs under an activated renine-angiotensine-aldosterone system, for example in hepatic diseases like liver cirrhosis patients . Recently, we revealed that renal RI measurement in liver cirrhosis correlates with the degree of vasoactive dysregulation and is an early sign of renal impairment as hints to a risk for hepatorenal syndrome. Liver cirrhosis patients with ascites (0.74) revealed significantly higher RI values than patients without ascites (0.67) and patients with elevated creatinine (0.77) had higher values than those patients with normal creatinine (0.69) . In multiple myeloma patients there was no significant difference between RI of those with elevated creatinine (0.71) and those with normal creatinine (0.68). Obviously, the structural alterations of the kidneys do not lead to relevant vasoconstrictive effects. In multiple myeloma patients kidneys are most frequently damaged directly by light chain components of the monoclonal immunoglobulin causing proximal tubular deletions and consecutive interstitial cast nephropathy . Beside this, amyloidosis and light chain deposition disease are other causes of chronic renal impairment in multiple myeloma patients. As there is usually no therapeutic consequence invasive renal biopsy to determine the type of renal damage is not routinely performed and not recommended. Also in our patients, histology of renal disease was not obtained. Renal failure is a complication of high tumor burden and is a risk factor for a lower response to treatment and a poor prognosis [7, 18, 19]. Hypercalcemia, dehydration, infection, hyperuricemia and the use of nephrotoxic drugs also contributes to its aggravation  so that up to 3% of the patients require at least intermittend dialysis [3–8]. After effective chemotherapy approximately 25% of the patients recover normal kidney function . The renal recovery correlates with the reduction of free light chains by plasma exchange . This has also been shown for new therapeutic approaches in recurrent and refractory multiple myeloma. In these severe cases, Bortezomib for example, a selective and reversible proteasome inhibitor, provides clinical benefit of kidney function . So far, no Doppler sonographical data exist whether vascular dysregulation occurs in myeloma kidneys and if these hypothesized effects would show reversibility under effective therapeutic regimen. Our results reveal only a non-significant elevation of renal RI in multiple myeloma patients compared to RI in healthy controls. Analogous studies have already been performed for systemic lupus nephritis, another kind of interstitial nephropathy [23, 24]. Herein, the data were controversial so that it remains unclear whether renal RI is elevated or not in these patients. In contrast, significantly more myeloma patients with elevated creatinine and BUN as well as reduced GFR values reveal hyperechogenic kidney parenchyma than those with normal renal function, which is a morphological sign for interstitial nephropathy. In summary, in spite of the limited number of patients measurement of renal RI does not give hints to a relevant vasoconstriction and is therefore no relevant parameter for the diagnosis of cast nephropathy of multiple myeloma patients. Routinely performed ultrasound examination should be more focussed on the qualification of parenchymal echogenicity. This study was supported by grants of the Friedrich-Baur-Stiftung (Munich).